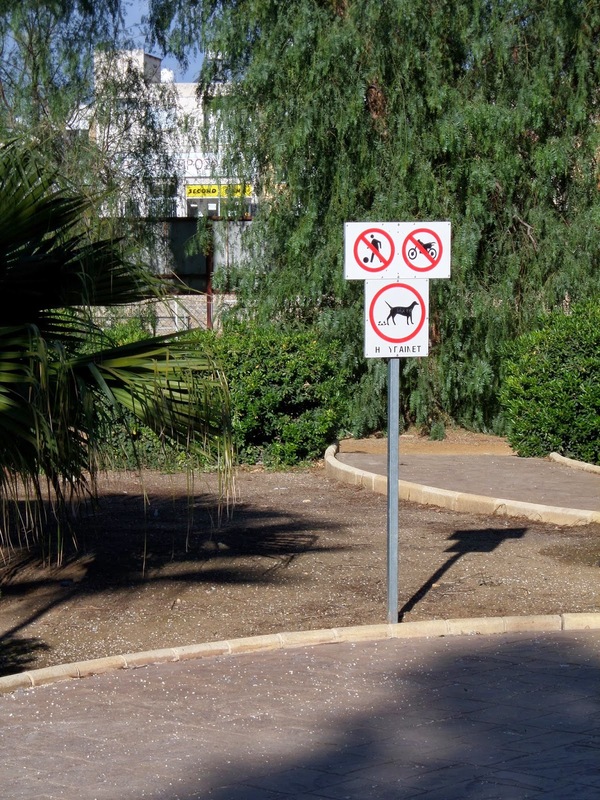 Laws concerning where pets are and are not allowed to go in Cyprus seem to be constantly changing and absolutely incomprehensible to everybody (perhaps that's the idea..). I have read that a recent change in the law (2010 or 11) allows dogs in public spaces in Cyrus, except for beaches and children's play areas. This is in accordance with EU legislation. 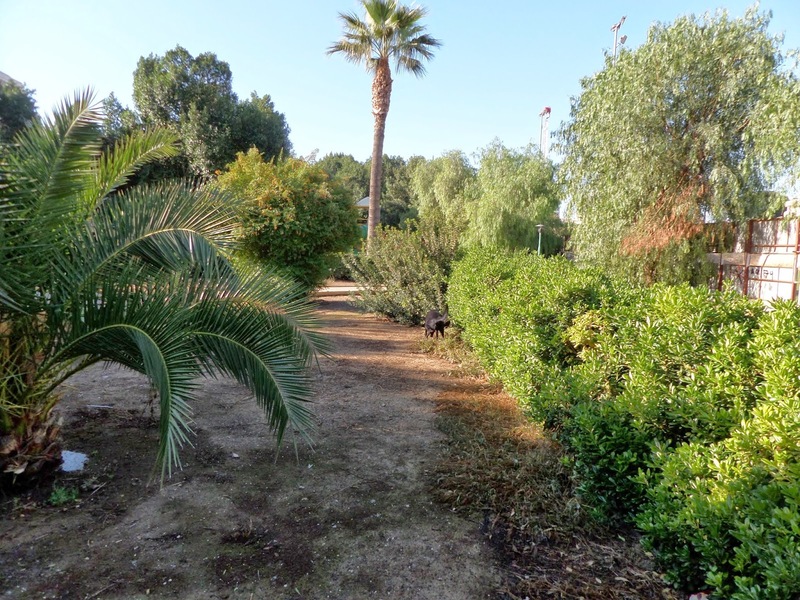 However, I haven't seen much sign of this changing, at least not in Larnaca, Lemesos or Paphos, where public areas such as parks, waterfront etc. still display off-putting signs forbidding dog owners to walk their dogs there. 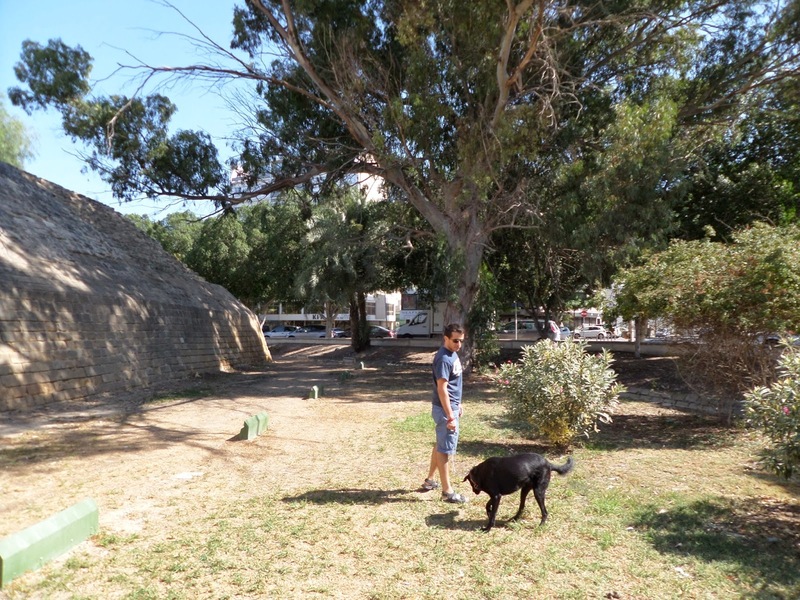 So these areas of Nicosia, around the city walls, make quite a refreshing change. 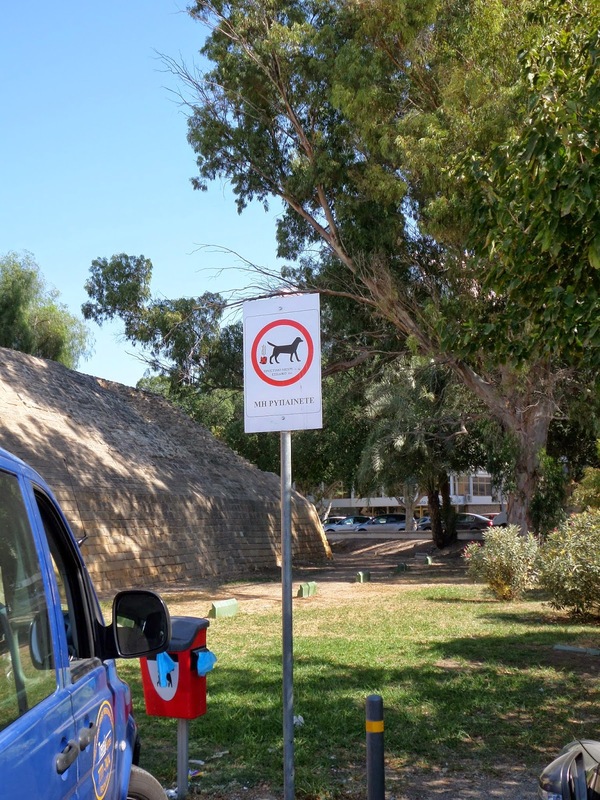 By the entrance to the park area at Famagusta Gate, and a little further round in Toufexi Park are signs telling owners to clean up after their dogs, and bins to dispose of dog mess. There are even bags provided, to make it even easier. This is about as close to a dog park as Cyprus gets (with a couple of notable exceptions). 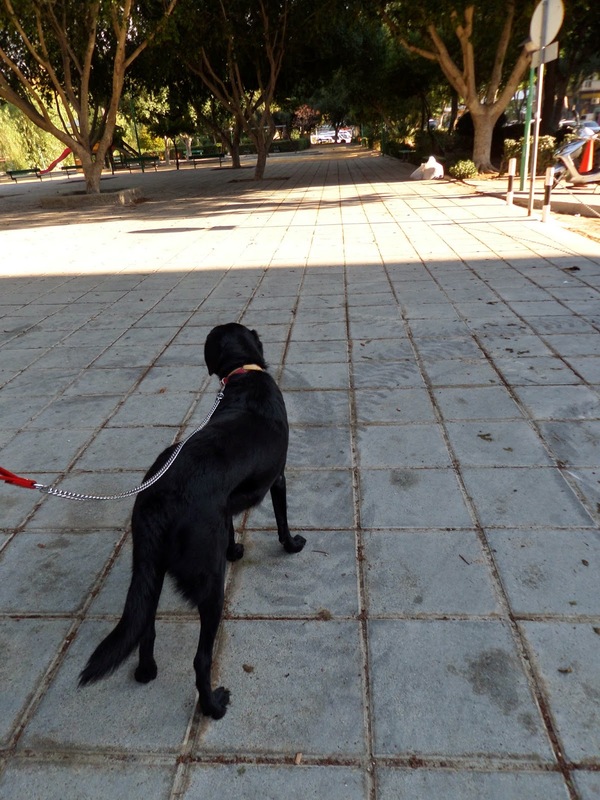 These areas are popular with dog walkers of Nicosia, especially in the 'dog-walking rush hours' before and after work. I have been meaning to bring Sage here for a play for a long time, but never getting round to it. 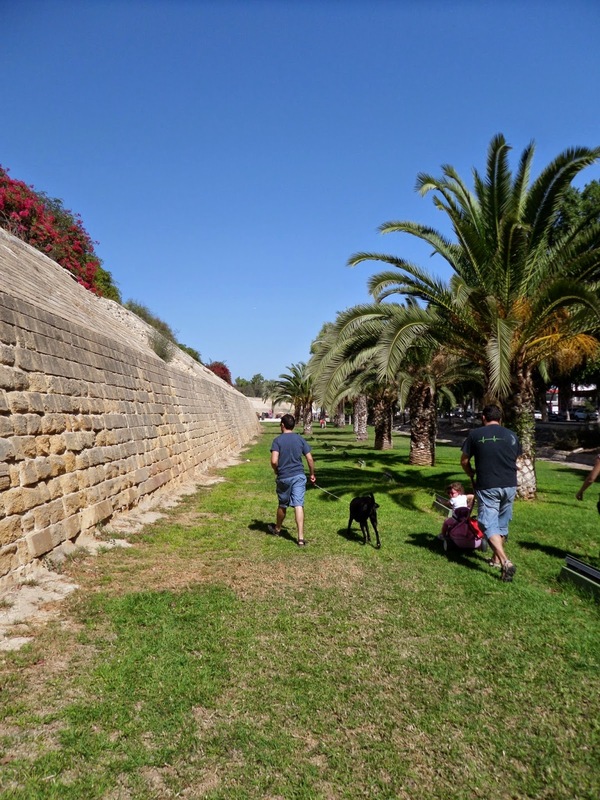 The only time we've been here was for the annual Pet Festival, which is held outside the walls at Famagusta Gate, and of course the whole area was full of dogs. 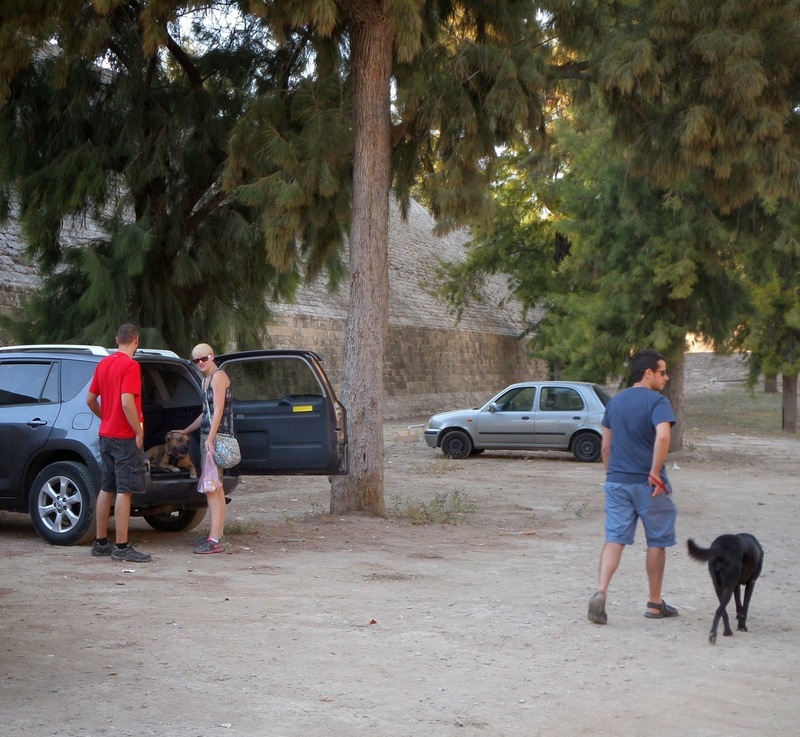 There is a Facebook page for a real dog park in Nicosia, which is in a small area of Athalassa Park (dogs are not permitted in the rest of the park). I didn't enjoy this park much when I went; there were no other dogs around, nor bins for dog poo, we got lost and carried a stinking bag of dog poo for about an hour until something close to a monsoon started and we found ourselves running through muddy fields trying to find our way out... I will try again, maybe on a day with no rain forecast, and see if I have a better experience. I would love to find a few areas where Sage can socialise and run about with some canine buddies. Hi, I enjoy your blog very much, and your dog is lovely. Regarding this post, and especially the last photo, I realized that this is the park I used to take my two lovely dogs until one day a very rude man verbally attacked me that I wasn't allowed to take my dogs there (despite the signs that suggest I am allowed!) and even the owner of this small coffee shop next to the playground DARED TO THREATEN ME THAT HE WILL PUT MEAT WITH POISON SO MY DOGS EAT AND DIE!!! !please try to avoid this particular area where this small coffee shop is.I really think he meant what he said. I would hate to hear that another dog got poisoned there. Oh! Good thing you noticed that. Thanks a lot for your warning. You ARE allowed to take your dogs there. It's a real pity someone wants to spoil this; there really are so few places you are officially allowed to go with your dog in Cyprus. I'm saddened you had such a negative experience and I hope you found somewhere nice to take them instead. If you have suggestions for good dog walks in Nicosia, I'd love to hear of them!!! thank you for the link, very useful. You should try the area in the English School (opposite Presidential House). The area is very wide, with some uphills and downhills which resemble mountains! You will get a feeling you are in the woods! There are also many dogs where your dog can play or you can just walk the routes and enjoy the view. Hi, im belgian and we will go to Famagusta District soon (Kapparis probably) for a year minimum. We couldn't imagine our lives without dogs. We will come with a greyhound (our german sherperd is badly sick). Im so sad to read that dogs are not permitted and hated in so much places. Is there a map with beaches allowed to dogs . Is there any changes since april 2014 ?